For works with similar titles, see The Code of Hammurabi. created circa 1760 BC, is one of the earliest extant sets of laws and one of the best preserved examples of this type of document from ancient Mesopotamia. The Code contains an enumeration of crimes and their various punishments as well as settlements for common disputes and guidelines for citizen's conduct. The Code does not provide opportunity for explanation or excuses, though it does imply one's right to present evidence. 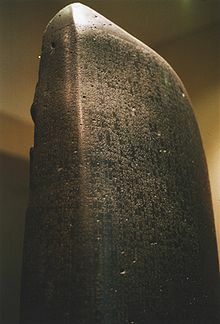 The laws, which numbered from 1 to 282 (numbers 13 and 66-99 are missing), are inscribed in Old Babylonian on an eight-foot tall stela of black basalt. The code is often pointed to as the first example of the legal concept that some laws are so basic as to be beyond the ability of even a king to change. Because Hammurabi had the laws inscribed in stone, they were immutable. This edition was translated by Leonard William King in 1910. Some portions of the text have been lost in the intervening centuries; these are designated with [...]. Photograph of the original code of laws, on display at the Louvre museum in Paris. More images are available at commons:Code of Hammurabi. When Marduk sent me to rule over men, to give the protection of right to the land, I did right and righteousness in [...], and brought about the well-being of the oppressed. 9. If any one lose an article, and find it in the possession of another: if the person in whose possession the thing is found say "A merchant sold it to me, I paid for it before witnesses," and if the owner of the thing say, "I will bring witnesses who know my property," then shall the purchaser bring the merchant who sold it to him, and the witnesses before whom he bought it, and the owner shall bring witnesses who can identify his property. The judge shall examine their testimony — both of the witnesses before whom the price was paid, and of the witnesses who identify the lost article on oath. The merchant is then proved to be a thief and shall be put to death. The owner of the lost article receives his property, and he who bought it receives the money he paid from the estate of the merchant. 23. If the robber is not caught, then shall he who was robbed claim under oath the amount of his loss; then shall the community, and [...] on whose ground and territory and in whose domain it was compensate him for the goods stolen. 24. If persons are stolen, then shall the community and [...] pay one mina of silver to their relatives. 33. If a [...] or a [...] enter himself as withdrawn from the "Way of the King," and send a mercenary as substitute, but withdraw him, then the [...] or [...] shall be put to death. 34. If a [...] or a [...] harm the property of a captain, injure the captain, or take away from the captain a gift presented to him by the king, then the [...] or [...] shall be put to death. 100. [...] interest for the money, as much as he has received, he shall give a note therefor, and on the day, when they settle, pay to the merchant. 111. If an inn-keeper furnish sixty ka of usakani-drink to [...] she shall receive fifty ka of corn at the harvest. 274. If any one hire a skilled artizan, he shall pay as wages of the [...] five gerahs, as wages of the potter five gerahs, of a tailor five gerahs, of [...] gerahs, [...] of a ropemaker four gerahs, of [...] gerahs, of a mason [...] gerahs per day. Hammurabi, the king of righteousness, on whom Shamash has conferred right (or law) am I. My words are well considered; my deeds are not equaled; to bring low those that were high; to humble the proud, to expel insolence. If a succeeding ruler considers my words, which I have written in this my inscription, if he do not annul my law, nor corrupt my words, nor change my monument, then may Shamash lengthen that king's reign, as he has that of me, the king of righteousness, that he may reign in righteousness over his subjects. If this ruler do not esteem my words, which I have written in my inscription, if he despise my curses, and fear not the curse of God, if he destroy the law which I have given, corrupt my words, change my monument, efface my name, write his name there, or on account of the curses commission another so to do, that man, whether king or ruler, patesi, or commoner, no matter what he be, may the great God (Anu), the Father of the gods, who has ordered my rule, withdraw from him the glory of royalty, break his scepter, curse his destiny. May Bel, the lord, who fixeth destiny, whose command can not be altered, who has made my kingdom great, order a rebellion which his hand can not control; may he let the wind of the overthrow of his habitation blow, may he ordain the years of his rule in groaning, years of scarcity, years of famine, darkness without light, death with seeing eyes be fated to him; may he (Bel) order with his potent mouth the destruction of his city, the dispersion of his subjects, the cutting off of his rule, the removal of his name and memory from the land. May Belit, the great Mother, whose command is potent in E-Kur (the Babylonian Olympus), the Mistress, who harkens graciously to my petitions, in the seat of judgment and decision (where Bel fixes destiny), turn his affairs evil before Bel, and put the devastation of his land, the destruction of his subjects, the pouring out of his life like water into the mouth of King Bel. May Ea, the great ruler, whose fated decrees come to pass, the thinker of the gods, the omniscient, who maketh long the days of my life, withdraw understanding and wisdom from him, lead him to forgetfulness, shut up his rivers at their sources, and not allow corn or sustenance for man to grow in his land. May Shamash, the great Judge of heaven and earth, who supporteth all means of livelihood, Lord of life-courage, shatter his dominion, annul his law, destroy his way, make vain the march of his troops, send him in his visions forecasts of the uprooting of the foundations of his throne and of the destruction of his land. May the condemnation of Shamash overtake him forthwith; may he be deprived of water above among the living, and his spirit below in the earth. May Sin (the Moon-god), the Lord of Heaven, the divine father, whose crescent gives light among the gods, take away the crown and regal throne from him; may he put upon him heavy guilt, great decay, that nothing may be lower than he. May he destine him as fated, days, months and years of dominion filled with sighing and tears, increase of the burden of dominion, a life that is like unto death. May Adad, the lord of fruitfulness, ruler of heaven and earth, my helper, withhold from him rain from heaven, and the flood of water from the springs, destroying his land by famine and want; may he rage mightily over his city, and make his land into flood-hills (heaps of ruined cities). May Zamama, the great warrior, the first-born son of E-Kur, who goeth at my right hand, shatter his weapons on the field of battle, turn day into night for him, and let his foe triumph over him. May Ishtar, the goddess of fighting and war, who unfetters my weapons, my gracious protecting spirit, who loveth my dominion, curse his kingdom in her angry heart; in her great wrath, change his grace into evil, and shatter his weapons on the place of fighting and war. May she create disorder and sedition for him, strike down his warriors, that the earth may drink their blood, and throw down the piles of corpses of his warriors on the field; may she not grant him a life of mercy, deliver him into the hands of his enemies, and imprison him in the land of his enemies. May Nergal, the might among the gods, whose contest is irresistible, who grants me victory, in his great might burn up his subjects like a slender reedstalk, cut off his limbs with his mighty weapons, and shatter him like an earthen image. May Nin-tu, the sublime mistress of the lands, the fruitful mother, deny him a son, vouchsafe him no name, give him no successor among men. May Nin-karak, the daughter of Anu, who adjudges grace to me, cause to come upon his members in E-kur high fever, severe wounds, that can not be healed, whose nature the physician does not understand, which he can not treat with dressing, which, like the bite of death, can not be removed, until they have sapped away his life. May he lament the loss of his life-power, and may the great gods of heaven and earth, the Anunaki, altogether inflict a curse and evil upon the confines of the temple, the walls of this E-barra (the Sun temple of Sippara), upon his dominion, his land, his warriors, his subjects, and his troops. May Bel curse him with the potent curses of his mouth that can not be altered, and may they come upon him forthwith. This page was last edited on 30 October 2018, at 17:14.